To live to you’re hundred is a remarkable achievement for anybody these days, but to do it in a previous era, where quality of life was not as it is today, is astounding. One such Blantyre person lived to 100 years old. Ms Templeton (wife of the Blantyre Blacksmith John Templeton) was born on the 16th November 1825. Although born in Limekilnburn in the parish of Hamilton, she moved to Blantyre shortly after marrying her husband. John had started a Blacksmith business in Barnhill in 1850 and was later involved in the alleged incident of building a flying machine at Larkfield. Her children (including her son who inherited the blacksmith business) and grandchildren attended the Barnhill Smiddy party on 16th November 1925 to celebrate her 100 years. The only person missing was her husband John, who had died 22 years earlier in 1903. 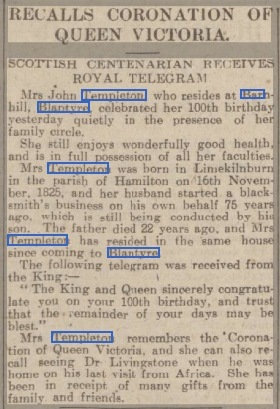 The newspapers recorded that Mrs Templeton was still in excellent health and contained all of her faculties, able to go about the house unaided. When interviewed, Mrs Templeton remembered the Coronation of Queen Victoria and recalled “seeing David Livingstone out and about in Blantyre”. She also received many gifts from all the family and friends. My grandfather assisted with the house clearance after the lady’s death. 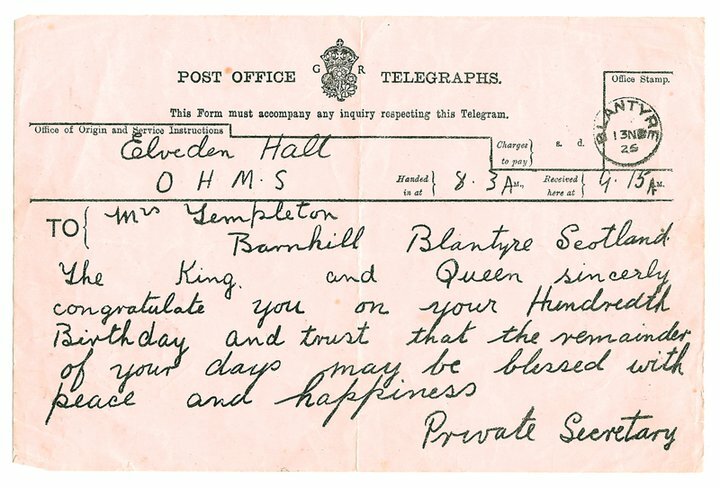 Being like myself interested in the history of Blantyre, the family by means of thanks and with no desire for sentimental paperwork, kindly gave him the telegram, passed down to my mum in 1971, passed to me in 2009. I think i would like to correct this situation, by keeping a copy of the telegram and offering it back to the rightful family. 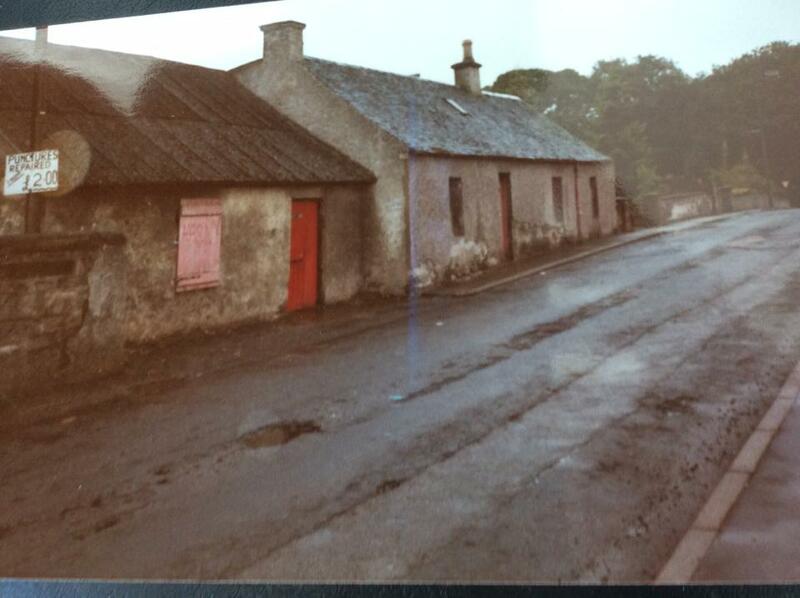 The picture below shows Mrs Templeton’s house and the smiddy, provided by Helen Williams and photographed in the late 1980’s.